Born into a working class family in Manchester, Duncan Hallas joined the Trotskyist Workers International League while still a young worker during World War II. Conscripted into the army in 1943 he was involved in the great mutiny in Egypt after the end of the War. Back in Britain he was one of the small number of comrades who rallied around Tony Cliff’s critique of “orthodox” Trotskyism and was a founder member of the Socialist Review Group, the forerunner of today’s British Socialist Workers Party and the International Socialist Tendency. During the long boom of the 1950s and early 1960s he lost contact with the group although he remained politically active in the teachers’ union and elsewhere. During the great upheaval of 1968 he rejoined the International Socialists, as the organisation was then called. 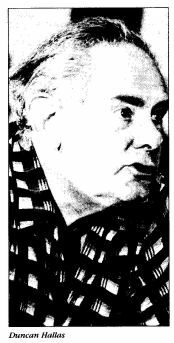 From that time he was a leading member of the organisation, a great populariser of Marxism and an inspired speaker, until ill health forced him out of active politics in 1995. You can listen to a small selection of talks in the Duncan Hallas Audio Archive. Do we support reformist demands? The Ruskin Debate: Their college or ours?